... about my friend Rachel. Rachel is the first friend I met through blogging. She left an encouraging comment about one of my knitting patterns, and I was so happy that someone out there was reading my blog. We've gotten to know each other over the last year through our blogs, emails, and monthly artist trading card swaps. Now Rachel seems like an old friend, even though we've never met in person. If you don't already know her, the above word cloud includes some of the words I associate with her. But I couldn't quite capture how funny she is, or thoughtful, or creative. Rachel leaves the best comments, she remembers the names of my cats, and her artwork blows my mind. She is an amazing friend. PS. Please stop by her blog at Not-So-Plain Jane if you'd like to meet Rachel and wish her a happy birthday! Happy Birthday Rachel! What a sweet post. I will go visit your sweet friend! Enjoy your day my dear! Thanks Stacy. sniff sniff. That's so sweet! I can't even think of anything cute or funny to say... I'm so overwhelmed. It seems funny that we've never met in person, doesn't it? I feel like I've known you for years. I agree. Rachel is a treasure. I know she is going to have a fabulous birthday! What a nice tribute to a good friend! What a very sweet post Stacy. Great way to celebrate Rachel's birthday. Happy birthday (again) Rachel! What a fun way to celebrate Rachel's birthday! She's definitely a keeper. Aren't blogs fun? I've met the nicest people through mine -- both you and Rachel!!! 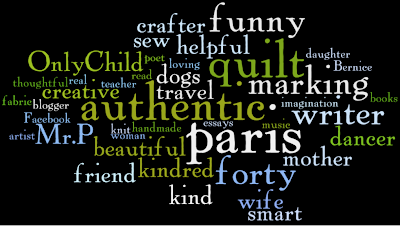 I just wanted to say that I really like how PARIS was displayed so prominently in the word cloud... because I am now the very excited owner of a plane ticket to... PARIS!